There is a new release in the Cubis franchize! Cubis Kingdoms Collector's Edition is a delightful puzzle and match-3 challenge for the fans of this genre! The Collector's Edition offers quite a few perks to make the game worth the money, but you want to check it out for yourself first! The seven colors represent seven different elements that you need to collect to save the kingdom. The game is not the one you play while sipping your coffee and talking to your coworker. It is the one that keeps you on your toes concentrated on the board you are playing. Your moves are limited and every one of them counts! No pressure, no pressure... but you better have a strategy before you make another move. You play a checkerboard that has cubes of seven different colors appear on it with every move. If you are not smart enough, the cubes stock up pretty fast. The highlighted tiles indicate where the new cubes are going to appear. The seven colors represent seven different elements that you need to collect to save the kingdom. 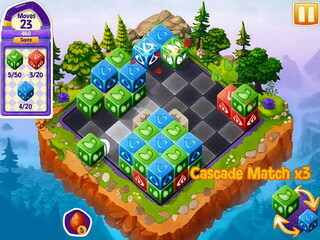 Each level you are tasked with a number of matches of specific colors. If you meet a goal for the level and still have moves (yay! ), you can continue getting rid of the cubes. The game is not easy, to begin with, and it gets more challenging as you play. You get all kinds of blocks added to the board (cats, portals, frost etc...) and you need to find a way around them. The good thing is that any level can be replayed to get three stars (or to even make it through for some of us). The game provides all kinds of fun power-ups (turtle shells and Pheonix eggs - how cool is that?!) for you be able to win every single level. There are 50 bonus levels as part of the CE extras. You also meet different allies and interact with animals as you proceed through the game. 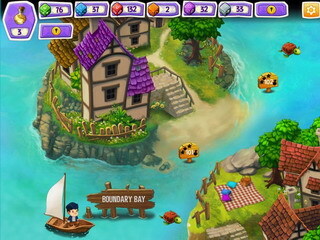 It is a wonderful game for those who love the extra challenge and strategies. Not to mention, the cool setting and characters! This is Cubis Kingdoms review. Download this game here.